Physicists from the University of Southampton were among the first researchers to use the new high magnetic-field beamline at Diamond Light Source, the UK’s national synchrotron facility, to search for ‘hidden magnetic states’. If found, they will provide important confirmation of a theoretical model, which could have important applications in magnetic data storage. Diamond’s new I10 Beamline for Advanced Dichroism Experiments (BLADE) beamline, which has 300,000 times the strength of the earth’s magnetic field, is providing them with the tools for the search. 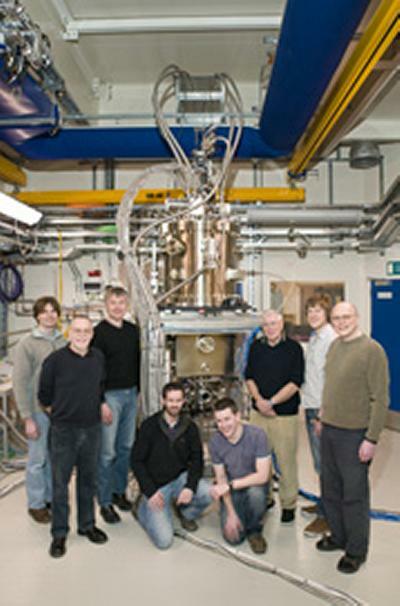 The beamline was developed through a partnership of several UK universities, including Southampton. A team led by Professor Peter de Groot, from Southampton’s Quantum, Light and Matter Group, consisting of physicists from the University of Southampton, the Clarendon Laboratory at Oxford and the Magnetic Spectroscopy Group at Diamond, is looking for ‘hidden magnetic states’ in a type of magnet that has been identified as an ideal candidate for data storage. The composition of this magnetic film material is such that it provides sufficient energy barriers to prevent thermally-activated data loss, with the potential to relieve the present limit on the storage density of hard disk drives. Professor Graham Bowden from the University of Southampton explains: “We are using the 14 Tesla Oxford Instruments superconducting magnet on the BLADE beamline to study exchange-spring magnets. Our exchange-spring magnetic multilayers consist of alternating hard and soft-magnetic layers, in which the magnetisation arranges in spring-like magnetic nanostructures. Such magnets offer additional flexibility in optimising magnetic properties, with possibilities for superior data storage capabilities. The Southampton team has been allocated further beam time to continue this research in early 2013.